You are currently browsing articles tagged Nero. 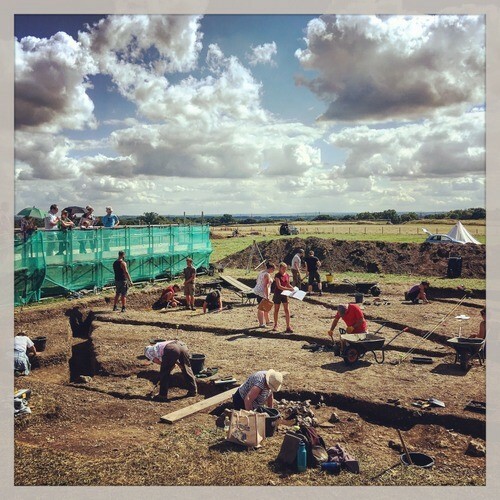 As a research and fieldwork active archaeology department, we are extremely fortunate to have one of Britain’s best preserved Roman and Iron Age towns on our doorstep – Silchester, or Calleva of the Atrebates, is less than 10 miles from the Department of Archaeology’s door. 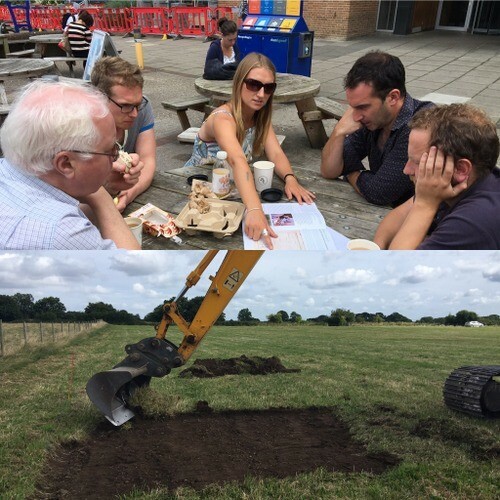 The department has been carrying out fieldwork at Silchester, led by Professor Michael Fulford, for nearly 40 years – and this largely undisturbed greenfield site provides many opportunities to pose new research questions, and then to answer them through cutting edge fieldwork. Excavation planning: Step 1 – bring in the machine! 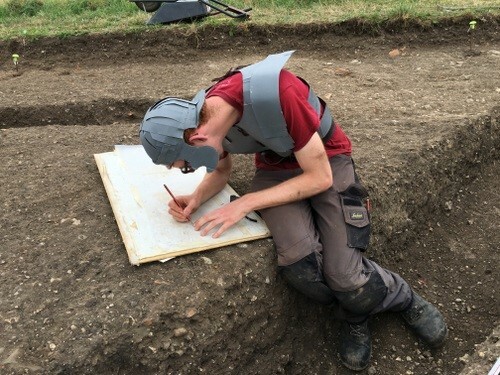 For the last 4 summer seasons we have been searching for structural evidence that the Roman Emperor Nero (Emperor from 54 to 68AD) commissioned a palatial residence in the provincial capital of Calleva Atrebatum. Our excavations in Insula IX between 1997 and 2014 had thrown up tantalising evidence for this in the form of high quality building stone incorporated into the foundations of later Roman buildings, as well as pottery tiles stamped with Nero’s name. These tiles are found nowhere else in Britain, and their discovery hints at a high level of imperial involvement – and even investment – into the town. But where exactly was Nero’s palace? Archaeologists test hypotheses – and ours was that Insula III, centrally located within the town, held the secret – and possibly also the Nero commissioned palace. The Victorians had excavated here in the late 19th and early 20th centuries, and their resultant town plan suggested the presence of a stone founded building of good size. And indeed we thought we might have found it when, in 2013, we began digging in the south-east corner of Insula III and uncovered the colonnaded remains of a mid-1st century AD building, which, at first trowel, looked substantial and significant. However 4 seasons of work later, we can unequivocally state that Insula III did not contain a luxurious home to rival those of Rome, and built for a supportive British ruler or noble with Nero’s patronage. Instead we found an unfinished and fairly flimsy structure, built over layers of clay and gravel dumped to offset the soft and slumping fills of the underlying Iron Age pits and wells. It must have been a bitter blow for the builders of Nero’s time to realise that prime building land in the centre of the Roman town, next to the forum, was unsuitable for solid masonry structures. Instead we surmise that the area lay largely unused until the late Roman period when the desire for prime real estate overrode the restrictions of the earlier centuries and allowed the construction of gravel founded timber buildings, jostling for space in this most desirable of town locations. Archaeology is a voyage of discovery and even if we don’t find what we hoped or expected, there is always a net gain in knowledge. This summer was our last chance to find Nero, and through the use of our – by now – tried and tested methodology of investigating the archaeology of Insula III by simply re-excavating the trenches dug by our antiquarian forbears and using the emptied trenches as ‘key-holes’ into the undisturbed layers, we uncovered a new and detailed sequence from the natural geology through to late or post Roman occupation, followed by 2 phases of Victorian excavation. We dug for 3 weeks in August and September of this year – and, as it turned out, we had the very best of an English summer: some hot days, lots of bright sunshine, and very little rain. A relatively small research excavation such as this also provides a great opportunity to give employability placement opportunities to our part 2 and Part 3 students, particularly those hoping to enter a career in commercial archaeology. But – to be honest- everyone should add an excavation to their CV – working as part of a team, communicating, solving problems: these are skills all graduates should have on leaving university. Plus, it is enormous fun – working together towards a common research aim, in what can sometimes be challenging physical conditions – what’s not to like? 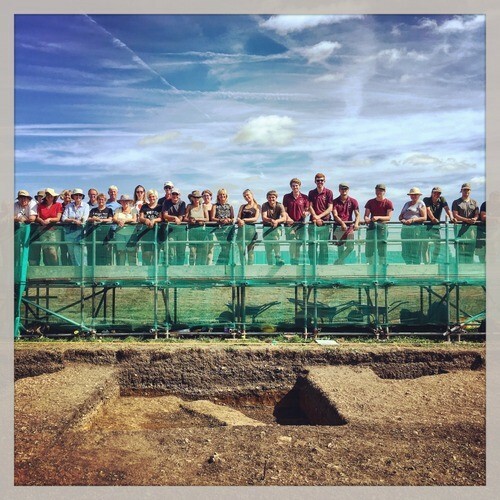 We opened 3 trenches – each with their own objectives – and we had a workforce of up to 20 on site, including a team working with our Finds and Visitors. The stage was set! Step 1 was to get the machining right – using a JCB to strip the turf and topsoil off is a challenging task. Take too much off, and you risk losing vital late and post Roman evidence; take too little off and you are condemning your team to days of backbreaking digging of sterile topsoil deposits and the risk of not finishing on time… With the help of a truly talented digger driver, we got it exactly right, and within a day we could quite clearly see the outlines of the diagonal Victorian trenches as darker stripes cutting through the topsoil and subsoil. Also immediately visible were striations and patterns of gravel which, on cleaning, began to show themselves to be outlines of a late Roman building completely missed by the Victorian excavators whose sole work purpose was to discover large pieces of masonry and exciting artefacts. By the end of the excavation, each trench had a story to tell, and when we left site with a complete record – plans, photographs, samples, finds, record cards – we left behind a very light touch on the archaeology of this major Roman town. We learnt a great deal about the nature of the Victorian intervention, as we tried to second guess their strategies – they do not record exactly how and where they dug – only what they found. Sifting through the finds in their backfill is equally remarkable in terms of what they threw back in – what they deemed unimportant – or unrecognisable, becomes a treasure trove for us. The antiquarian archaeologists before us gave us no light and shade, no detail of the lives of the people living there. We can now fill in those gaps. As with elsewhere in Insula III, we identified substantial clay levelling of a 2nd century AD date, over an uneven surface, and not much construction work until the late Roman period – when a series of gravel-filled foundation trenches were dug to support a large, rectangular building in the north-west corner of the insula. This building had clay and gravel floors (most of which did not survive) and was subdivided into a number of rooms. Associated with it were a sequence of substantial postholes cut into the edge of the gravel surfaced street, dug and re-dug, used and re-used over time, recognising, marking and regularly replacing a boundary. The Victorian excavators of the 1860’s and the 1890’s did not recognise this as a building as such – and so we felt a great sense of achievement when adding it to the known plan of late Roman Silchester. 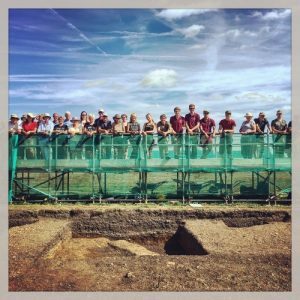 Discovering a previously unknown Roman building is not something you do every day! Every excavation has its disappointments – and ours was no exception, We had begun this project in 2013 in the south-east corner of Insula III, looking for a palace of Nero, and we ended in 2016 in the north-west corner knowing that we had not found this building – at least not in Insula III – but knowing that there is enough material evidence to suggest that it is likely to be somewhere within the town. So – no wonderful treasures, no palaces of kings – this time – but we now know what Insula III was all about, and another piece of the jigsaw has been slotted into place. And we had a lot of fun doing so; thanks to a fantastic team!